The traveling golfer is not a new concept, and members of THP have gone to great lengths to make events all around the country. As a person that travels regularly for the game, one thing has continually come up during preparation of the trip, and that is power. Not the kind that makes us swing the golf club harder, but the kind that keeps our devices such as GPS, cell phones and tablets charged. Until now, that meant making sure that each device had its cord for charging packed and ready to go and that there was an outlet nearby. Goal Zero has an often overlooked device as it pertains to golfers and one that might be a great solution for those that like to travel. Go-anywhere, rechargeable battery pack keeps your handheld gear going strong. Charge AA/AAA batteries from the sun or any USB port, then power your phone, MP3, GPS, or perk up your tablet in a pinch. As you can see from the video above, the device is capable of keeping you fully charged while on the road, both from the sun and the rechargeable battery pack that comes with the kit. The Guide 10 is designed to keep your devices full and usable during daylight hours, as well as night. THP testing of the product was a two step process. Before getting into that however, I want to note that both parts of the device fit easily in just about any side pocket of a golf bag, as well in just about any piece of luggage that one might have while traveling. First up to test was the solar panel and using it to keep a GPS charged during travel. Resting the device on the front of the golf cart, plugged into our trusty GPS device for a round of golf, the unit stayed charged the entire round. While most GPS units can last a minimum of a round or two, the unit being used was still at 98% at the end of eighteen holes. Playing the second round of the day for testing, the GPS was unhooked from the solar panel and the device had drained to 53% by the end of the round. One of the great aspects of the Guide 10 Plus kit is that it can work day or night, despite being based on solar energy. The battery pack that accompanies the solar panel works as the video explains above. You can charge it up using either the solar panels or attaching it to a power source and then charge anything that uses a USB connection. To say this worked flawlessly would be an understatement. The battery pack was charged before the trip and again while on the road using the sun as the means to fill it back up. The pack was then used to keep two smart phones and a GPS charged without any issues at all. When the kit ran low, it was plugged into the panels to fully recharge. Is it flawless? No. A cloudy day the second time out left the solar panels struggling to catch enough power to keep us charged. This is where the beauty of the battery pack comes into play. However, without that side of it, you will need the power of the sun for the device to work at its full potential. The most asked question received during the review process was exactly how long it took to charge devices. With direct sun, it took about 2 hours to charge the battery pack to full capacity and about 60-75 minutes to completely charge our devices from there. If you are a traveling golfer or just a traveler in general, this is a device you should take a look at. It offers the ease of mind that one charger will take care of everything, and while you will not always be in direct sunlight, the accompanying battery pack takes care of those nighttime situations quite well. 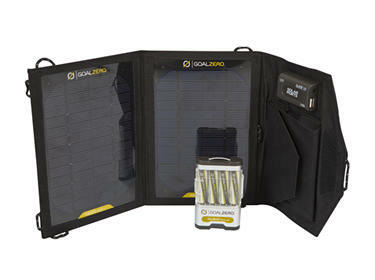 For more information on this or any other product available from Goal Zero, check out their website at www.goalzero.com. Price Ranges from $79 to $1799 depending on kit chosen. Great info here, could definitely see this being useful for many. Nice to see a product like this actually performing as advertised. Good write-up JB. Glad to see this type of thing being used in golf settings. My folks use to have a similar unit on the dash of their motorhome to keep the batteries charged while staying out in the desert of Arizona all winter long. Worked like a champ. I’m wondering if I could adapt one to the roof of my cart to charge while playing. I can think of more than a few times that something like this would have come in handy on the golf course. With a couple youngsters, I really don’t like to have a dead phone and it happens from time to time. Not to mention the days that I forget to charge the GPS. Thanks for the review. If i had more time to play 36 holes a day then this sounds like it would be a definite. Unfortunately, those days are mostly gone. Thanks for the review JB, sounds like a great product.